I was so happy to hear that Jillian Michaels slammed the Keto diet a few days ago. Because I never once thought it was healthy, and the fact of the matter is, people need to stop being phobic of carbs in general. I have lost 50 lbs ever since I started my weight loss journey (and I have 30 more to go but I will get there this year) and I most definitely have been eating carbs, and I have been splurging on whatever I want to eat once a week. This I know has also helped me stay on track because I don’t feel deprived and you also get some physiological benefits of throwing your system out once in a while by shocking your metabolism. That is by increasing your caloric intake drastically for one day and one day a week only, but the trick is to make sure you get back into business the day after so you can reap those benefits. If not, then you will end up gaining weight if you end up allowing that day to derail your progress. All I can say is that I never have had a problem with getting back into my healthy eating habits the day after I indulge in nachos, or a burger and fries dinner, or a delicious and rich sundae or cheesecake- whatever I want to splurge on which is always planned in advance. You get the idea. Anyway, I won’t go on and on about the benefits of having one cheat day a week in this post, because I am here to focus on the issues I have with the Keto diet. See the biggest reason that I don’t like this diet is because you need carbs. Plain and simple. You need carbs. In fact, a renowned and registered dietician in Toronto named Abbey Sharp made it clear that parts of your brain must run on glucose and nothing else! With that said, she also made it clear that the keto diet is not a good and a healthy weight loss solution as well. So here is the thing. I lost 50 lbs in a year! I did it in a slow but a progressive and healthy way, and I have eaten carbs every day! That’s right! I eat plenty of carbs. I eat crackers, pitas, fruits, vegetables, and even rice and pasta! Yes, that’s right! I have been losing weight while I have been adding carbs into my diet! But, here is the thing. What people need to realize is that carbs themselves are not the enemy when it comes to losing weight! The trick is to eat the right type of carbs because not all types of carbs are the same. And, people get panicky about carbs because they think that the carbs that are from candies, white flour, and from junk food are the same as carbs that you get from whole grains, fruits, and vegetables. If this is what your belief is as well, then you must hear me out. Simple refined carbs from junk food are not in the same category as complex carbs from whole grains, fruits, and vegetables. And, the reason that simple carbs are the culprit for weight gain is that they provide a quick energy release that will cause your insulin and blood sugar levels to spike up. This ends up causing you to crash quickly, and also causes you to be hungry again right after while your insulin levels and blood sugar levels are still high. And, you will be so hungry to the point that you will not only give into it but you will overeat which in the end leads to weight gain and can lead to complications such as diabetes and hypertension. However, complex carbs do not cause this to happen. They provide you the energy that you need to function and the energy release from these carbs is very slow which means your insulin and blood sugar levels will not spike! You will have plenty of energy, and you will not be hungry again as a result, until your body truly is ready to get more fuel again. In other words, you will be kept full for a while even after eating foods that are made up of complex carbs. And, the next time hunger will strike is when you genuinely are ready to take in more food for energy again. Your blood sugar and insulin levels will not be affected by eating complex carbs due to the fact that the energy is released slowly. And, you need this energy to function! So the keto diet does not permit you to consume many carbs, and you are supposed to replace carbs with fat. And, the problem is that your body really needs those healthy carbs to run on which too much additional fat cannot provide. And, yes, people may lose rapidly on the keto diet at first, but they will end up very sick in the end, and they will end up gaining their weight back and then some later on. In other words, the keto diet is not sustainable! Look, I am not telling anyone that my weight loss method is the only weight loss solution. Everyone needs to find what works for them because what works for me may not work for someone else. This means just because the perfect caloric intake of 1500 calories per day (except for my cheat days of course) for me that helps me keep my weight loss healthy and steady does not mean 1500 calories a day is right for someone else. Some lose weight on 1200 calories per day which is in the starvation territory for me (believe me I know and it was a very unpleasant experience trying that once upon a time), and others can only lose weight on 2000 calories a day. And, they may only benefit from eating 3 large meals with a few snacks instead of 6 small meals a day. Whatever! That is not the problem I have! 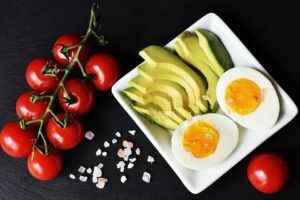 My issue is when it comes to weight loss is that you want to do it in a healthy and gradual way without omitting any important nutrients from your diet, which includes complex carbs. Quit believing that carbs are the enemy because not all carbs are! And, you can enjoy simple carbs as well in moderation, even on non-cheat days! Small amounts of junk food will not cause your blood sugar and insulin levels to spike if you keep the serving as small! I know this from experience. Please stay away from diet fads such as the keto diet and don’t omit anything that your body clearly needs! You need carbs, you need fats, you need proteins, but you need to know about the right ones to consume that will support your healthy lifestyle. And, just put a strong restriction on the wrong ones that will hurt your weight loss or maintenance efforts! But no need to completely omit that either as long as you keep the consumption of any of the non-beneficial foods restricted. The post I Agree With Jillian Michaels: The Keto Diet Is A Bad Idea appeared first on .